This article was shortlisted for the “Best Peer Reviewed History Article” in the 2015 Victorian Community History Awards. Douglas Wilkie, ‘Exodus and Panic: Melbourne’s reaction to the Bathurst gold discoveries of May 1851’, Victorian Historical Journal, vol. 85, no. 2, December 2014, pp. 189-217. When news of potentially rich goldfields near Bathurst, west of Sydney, reached Melbourne late in May 1851, there was a ‘migration of the population to New South Wales and … panic [was] created throughout the whole Colony’. At least, that is what a Victorian Legislative Council Select Committee reported in March 1854. [i] By contrast, in October 1851, just four months after the Bathurst news, Victoria’s Lieutenant Governor, Charles La Trobe believed that although the discoveries at Bathurst had ‘unsettled the public mind of the labouring classes … few comparatively of the labouring classes’ actually left Melbourne for Bathurst. 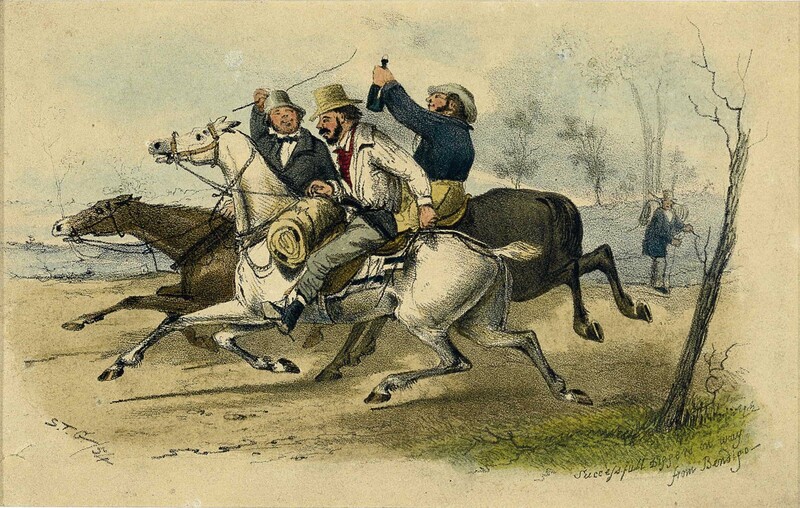 [ii] La Trobe’s description of comparatively few leaving Melbourne, does not match the panic and exodus of the Committee’s report; yet historians have repeated the report’s sentiments and ignored La Trobe’s ever since. This is an extract from the full article which can be downloaded from Unimelb Minerva or Academia. [i] ‘Report of the Select Committee of the Legislative Council on the Claims for the Discovery of Gold in Victoria, together with the Proceeding of Committee, Minutes of Evidence, and Appendix, 10 March 1854’, Votes and Proceedings of the Legislative Council during the Session 1853–1854, vol. iii, Melbourne, 1854, pp. 4, 10–12; Hereafter ‘1854 Select Committee’. [ii] La Trobe to Grey, 10 October 1851, House of Commons Parliamentary Papers (HCPP), 1852 (1430) (1508). [iii] Sydney Morning Herald, 29 March 1851, p. 6. [iv] Argus, 8 April 1851, p. 2. [v] Argus, 10 April 1851, p. 2. [vi] Argus, 11 April 1851, p. 2.